These Japanese rice crackers, or “Okaki” as they’re called in Japan, have such a simple and delicious flavour! 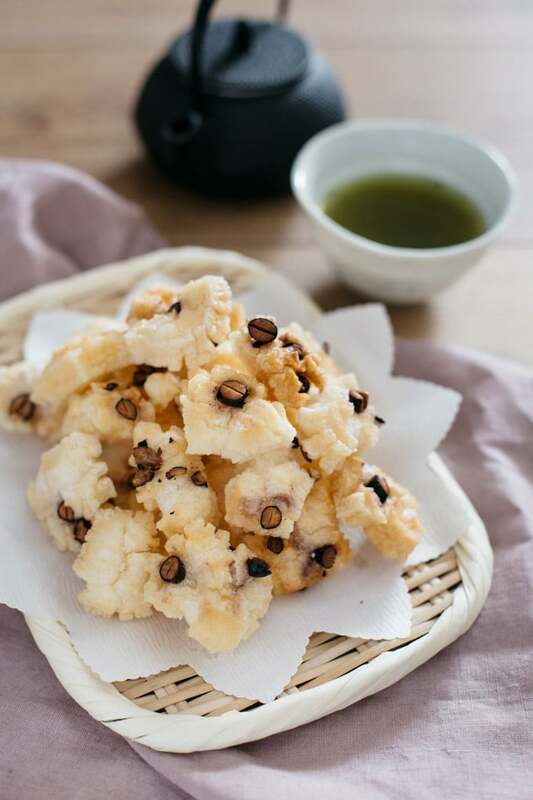 They’re only made from two ingredients: rice and salt, so they’re not full of odd flavours and additives and they make a great Japanese treat or party snack! There are mainly three types of Japanese rice crackers we eat in Japan: Senbei, Okaki, and Arare. The difference between those three is the size and ingredients. Senbei is made from “uruchimai (non-glutinous rice) and it is traditionally a flat round disk shape. Okaki and Arare are made from glutinous rice but the size differs. Okaki is bigger and chunky and Arare is smaller pieces. The making process of Okaki and Arare is the same. They both are essentially cut, dried, deep-fried mochi rice cakes. Why would you make it at home when you can buy store bought packet easily? 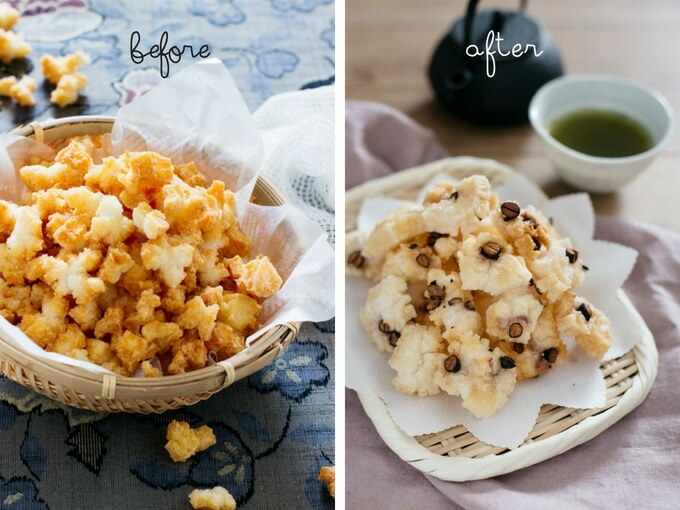 To be honest, I did not make Japanese rice crakers at home when I lived in Japan. I only started to make my own after we moved to Australia. Because Japanese rice crackers are readily available from any shops, you can even buy artisan Japanese rice crackers from department stores. But in Australia, there is not the same kind of subtle flavoured rice crackers and buying crackers from Japanese stores is a bit expensive. So believe me, it is worth while to make home made Japanese rice crackers if you don’t live in Japan. 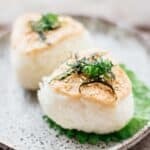 How to make Japanese rice crackers at home? Okaki and arare are made from sliced or cut mochi rice cakes. So you need mochi rice cakes. You can buy ready made mochi individually packeted from Japanese or Asian grocery stores. Japanese people often make this after new years, because they have plenty of mochi rice cakes left over from the new years feast. 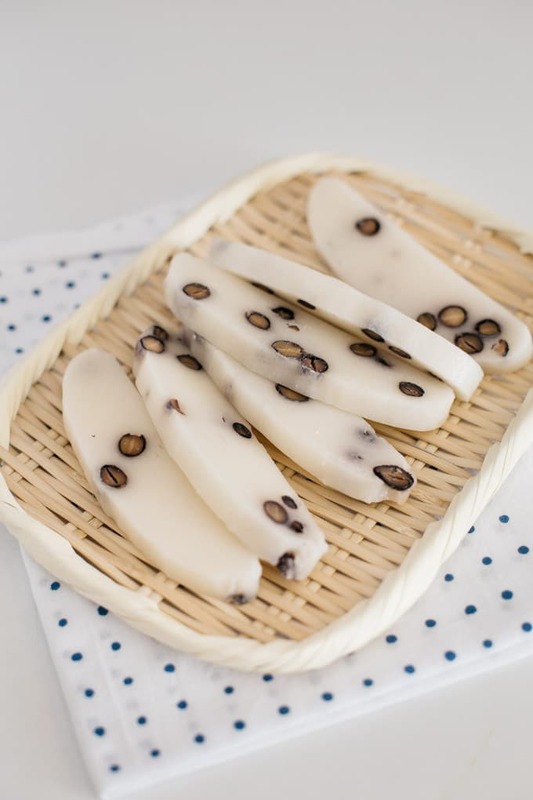 The mochi rice cakes are cut into small pieces and sun dried for a week. After it is completely dry, you will see small cracks on the mochi surface, you deep fry it at a low temperature. Add any flavour you like and you will have delicious freshly made Japanese rice crackers. Cut mochi rice cake about 3mm thin and spread out on a rack to sun dry for at least a few days or till a lot of small cracks appear on the mochi surfaces. 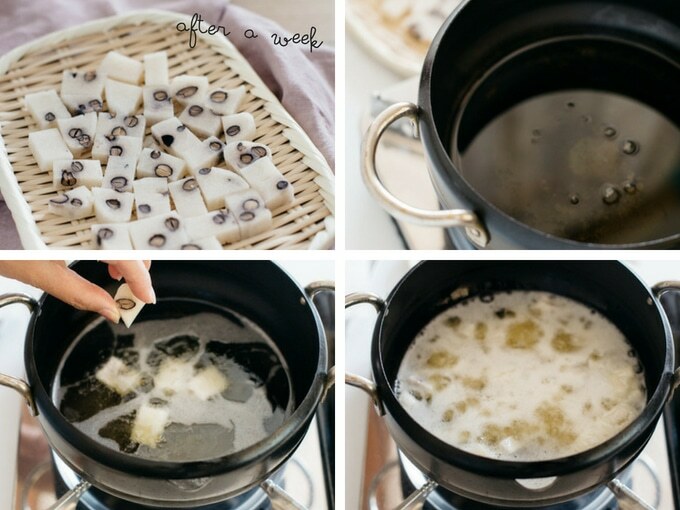 Drying the mochi completely will minimise any splash from the cooking oil when it is being fried. Also it guarantees to make crispy and crunchy Japanese rice crackers. 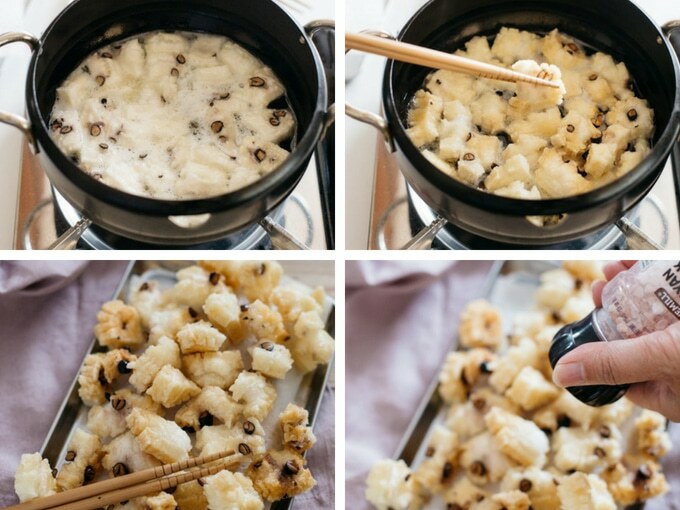 Deep fry the cut and sun dried mochi rice cakes slowly at a low temperature(about 160 Degree Celsius) and constantly turning the mochi rice cakes in order to brown evenly. 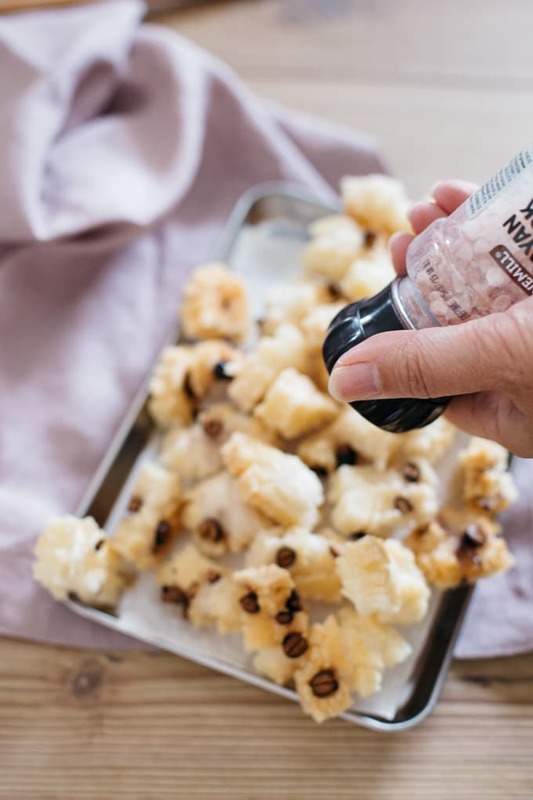 I personally like subtle sea salt flavour so just sprinkle salt over immediately when the crackers are cooked and you have drained the oil. There are many different flavours that you can try. You can either flavour the mochi rice cakes or season after the rice cracker is cooked. 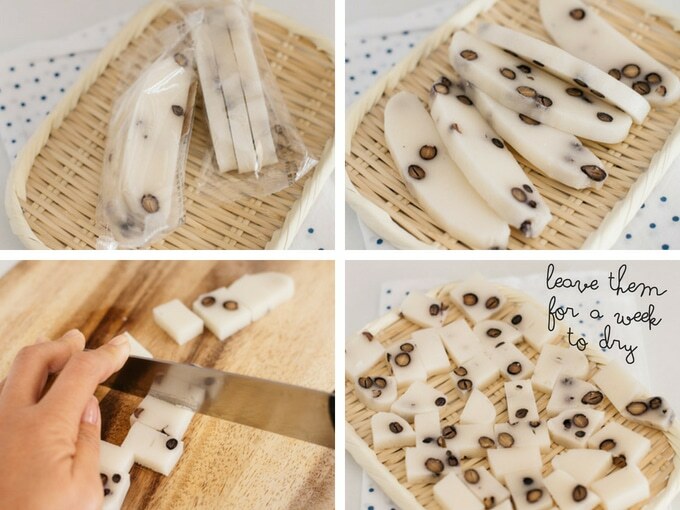 You can flavour mochi itself with Yomogi and black beans( like in the photos). Some of the after cooked seasoning options are soy sauce, granule sugar, nori seaweed, curry, and matcha etc. I know deep frying is not really good for your health. And since Japanese rice crackers are addictive and high in carbs, some of you may wont to opt for the healthier version if possible. Good news is yes, there is. The process of drying mochi rice cakes remains the same. The next step is to bake them in an oven instead of deep frying. Pre heat the oven to 180 degrees celsius. 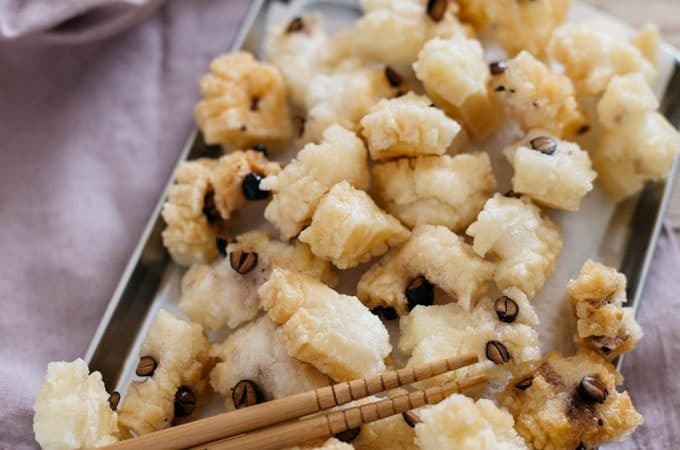 Spread out the cut and sun dried mochi rice cakes on an oven tray lined with parchment sheet. Bake it for about 20 to 25 minutes or till brown. 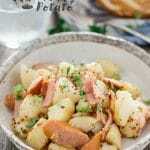 Here is my recipe for Okaki and If you liked it, please rate it and leave a comment below. Also, don’t forget to follow me on Youtube, Pinterest, Facebook , Twitter and Instagram to keep up to date with all the latest happenings on Chopstick Chronicles. Don’t forget to use the hashtag #ChopstickChronicles so I can see your wonderful creations! And check out Nagi’s Photo book. I have learnt so much from her photography book. 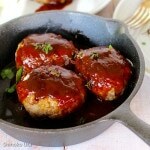 Take them out of the frying pan and place on top of a paper towel to absorb the excess oil and dry. *1 drying time is not included in prep and cooking time. *2 You only need the oil about 1-2 cm off the bottom of the frying pan. Or alternatively they can be baked in a oven instead of deep frying. See the above post for healthier option. *3 If you would like to use different flavour for example soy sauce instead of salt, brush soy sauce over the rice crackers. *4 nutritional value is an estimate and indication only as it is difficult to calculate exact amount of oil used. *5 you can purchase mochi rice cakes from Japanese or Asian grocery shops. or online . so interesting i like it ! Japanese mochi is the best!! I am the maker of OKAKIS. I will teach you how to make the lice crackers if you want. I want to eat OKAKIS that you made.